The easy way to manage your Cube World Server. Manage your server from anywhere with CWMyAdmins slick web interface. Recover from crashes automatically and restart your server with a single click. All of your servers functionality is just a few clicks (or taps) away. Restart your server now with one click, schedule an automated restart with three. No need to use the command line for trivial tasks. Based on the same core framework as McMyAdmin, CWMyAdmin enjoys the benefit of 3 years of development on a reliable platform on which to build remote administration software. The features available right now barely scratch the surface. 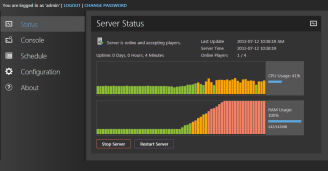 When the Cube World server is updated, CWMyAdmin will be as well to take advantage of new features. * The Cube World server itself does not natively support GNU/Linux at this time and requires Wine to run. CWMyAdmin is supplied with a native Linux binary.